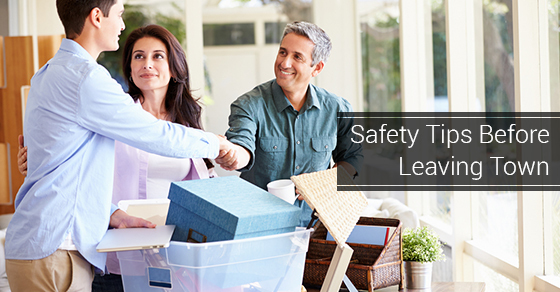 4 Home Safety Tips To Do Before Heading Out Of Town | Calgary Alarm Inc. Whenever you head out of town for a long period of time, your home is much more vulnerable to intrusion. It is important to take certain security measures to ensure that your home is well protected while you are away. Having a security system in place is the most basic and essential thing you can do, so if you don’t have one then that is one of the first things you should attend to. Once you have that in place, these steps can complement your security system to make your home even safer while you are out of town. If you know you are going to be away, provide the security company with contacts through which they can reach you. These contacts can also include people who will have access to your home. In such a case, make sure that these individuals know the codes to be able to disarm the system and avoid false alarms. It is always prudent to inform the company of your travel plans. If they know you are out of town (and you haven’t informed them of anyone else who will have access to the house), then they will know to inform the police right away if the alarm goes off. If any changes are to be made for dispatching, then inform the company in writing or through the appropriate medium as required. When going on a vacation it’s tempting to announce your travel plans to everyone via social media. Resist. You are essentially letting the world know that your house will be vacant and you may regret it afterwards. Only inform the people who need to be informed through private channels (including e-mail) and while you are on vacation, avoid posting the pictures you take until you get back. Even if your house is vacant, there are tricks to make it look “lived in.” Use a timer system for your lights so that it won’t be an instant giveaway for burglars who are on the prowl for a potential target. Arrange to have your mail temporarily stopped so that your mail box won’t pile up. You can even have some device playing, like a radio or television, to give the impression that someone is at home. And we’ll reiterate, the best security measure to have is a home security system. If you don’t have one and plan on going on a lengthy vacation, then have a chat with us to see what system would be best for your needs.